Being the saver that I am. I came across this awesome deal thru Groupon. This was my first time ever buying a Groupon. I get the emails, but just never found a deal that made me jump to buy. Until I found the deal for the Great wolf Lodge in Mason Ohio. The Groupon had several options / pricing to choose from. We went with option 3: one night stay for up to 7 in a kid cabin with a $50 restaurant credit. 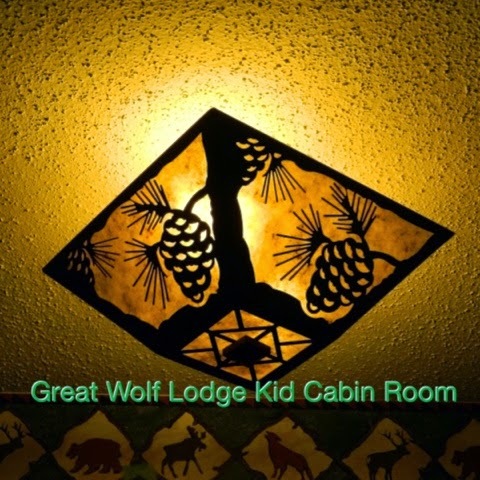 The Great Wolf Lodge is a very neat place to stay. The building and the rooms are very rustic. It is a place you could stay for days with out leaving. They have a small bowling alley, arcade, spa for adults, even a spa for kids, a game called Magi Quest and that's not including the very big water park. There is also three places to dine at, not including the snack bar inside the water park. One thing I found when researching this trip, was that there is not really true pictures of what the rooms inside the hotel look like. The website gives a layout of the design and some pics. But to me I thought it was not enough. So I took lots of pictures for everyone on what a Kid Cabin room really looks like. This is what the cabin looked like. I tried to get the pictures before the girls took over, but I was to late. The day bed. To me it looked like a twin bed. The rest of the room was a basic room. I liked the decor. I was shocked that there was not a flat screen. This hotel needs updated T.V's. I have a thing about bags being on the floor or on a bed in a hotel. So all bags had to go on the table or the dresser. The bathroom was a bathroom nothing special about it. I thought the light looked rustic. This light also made the room feel like a lodge. I don't think the price of the Kid Cabin is worth paying full price. It is just a room. At the end of the day when your kids get out of the water park, eat supper, they are so ready for bed. I thought our girls would be wired with it being their first over night stay together out of town. They barely got their baths, ate their supper and as soon as their heads hit their pillow they were out. They did not even fight over the top bunk. That's how tired these little ones were. Our trip was awesome. We loved the water park and when another great deal comes open, I will jump at the opportunity to stay at this wonderful hotel again. The room was comfortable. There was five of us and we all slept very comfortably. We even had the fire place going and it was nice. Please note that I was not paid to write this review or was not paid to stay at the Great Wolf Lodge. All opinions expressed was by the Nifty Thrifty Mom.